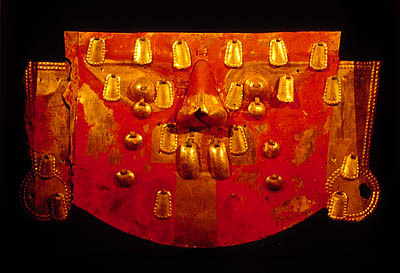 From Marvels of Machu Picchu: An Exclusive Exhibition of Photos by Beto Santillán. © 2008 Beto Santillán. All rights reserved. Machu Picchu, Peru Luxury Tours. 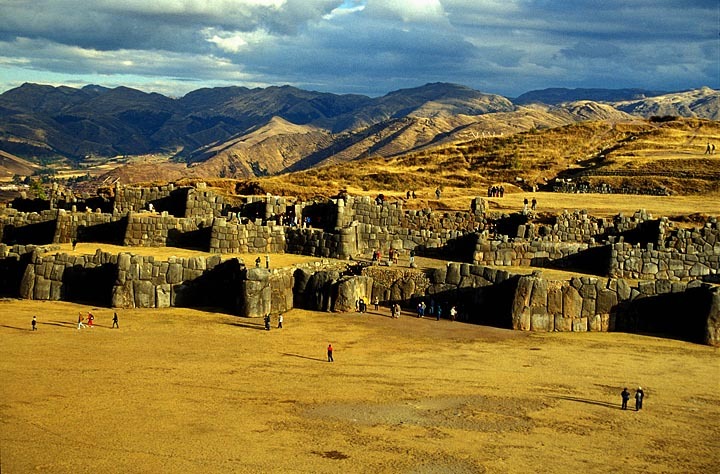 On your private exploration by Inka’s Empire Tours, expert guides and a masterfully designed itinerary put you face to face with the people, places and cultures of the Inca Empire. As you watch the sun rise over Machu Picchu, sail the ancient sea of Titicaca, observe rare species in the Amazon and cruise the Galapagos, you may ask yourself: “Is this real, or am I in an amazing dream?” Our video and photo albums hint at what’s to come. 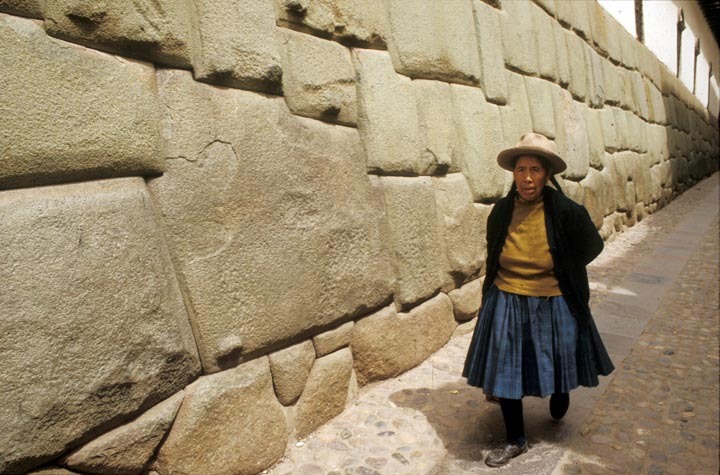 The Stone of Twelve Angles, Cuzco, Peru. From One Hundred Views of Peru: An Exclusive Exhibition of Photos by Mylene d’Auriol Stoessel. Photo: Mylene d’Auriol Stoessel. Machu Picchu, Peru Luxury Tours. From the roots of the Inca Empire in southern Peru to its glory in the imperial city, you will experience the panoramic history of the Incas and of the civilizations that inspired them to greatness. Archaeological sites, museums, folklore, native markets and traditional cuisine compose a cultural adventure you will always cherish. Discover the ancient capital of Cuzco, fabled Machu Picchu, the Sacred Valley and mythic Lake Titicaca.The living heritage of the Incas enriches your experience as you encounter weavers who are reviving ancient textile techniques, families who retain ancestral customs and shamans who perform traditional ceremonies still observed by the indigenous people of Peru. To deepen your appreciation of pre-Inca cultures, seek out the rich legacy of the Northern Kingdoms, the baffling enigma of the Nazca Lines and the legendary Andean Condor as it soars above the Colca Canyon. Along the way, feel the colonial splendor of Lima, where centuries-old plazas and palaces still evoke the days of Spanish kings. 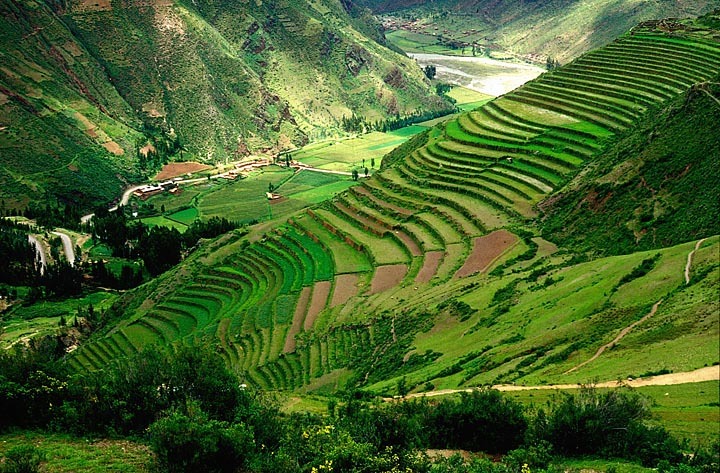 Terraces of Pisaq, Sacred Valley, Peru. Each of our wildlife expeditions in South America is a naturalist’s tour-de-force. If you cruise the extraordinary Galapagos archipelago, you can go ashore amid volcanic landscapes, hike among Marine Iguanas and lava lizards, and have the singular opportunity of snorkeling among penguins, marine tortoises and sea lions. On these enchanted isles, each with its unique habitat, you will learn how the adaptations of the species to their differing environments inspired Charles Darwin’s theory of evolution. If your quest is to experience the world’s rarest wildlife, Arcana MundiTM is the place to begin. Our trademark expeditions to nature’s secret places only are possible thanks to the lifelong research and exclusive access of Dr. Charles A. Munn, one of the world’s leading conservation biologists. In the Amazon and other tropical latitudes, you will observe rare creatures face to face, such as the amazing Golden Lion Tamarin (rescued from near extinction), the Puma, King Penguin and Andean Condor, the Jaguar in the wild, the Maned Wolf, “Nutcracker Monkey” and Hyacinth Macaw, the rarely seen Golden-backed Uakari Monkey and the emblematic white monkey, known as the White Uakari. To add an Amazon expedition to your tour in Peru, consider the Amazon Research & Conservation Center. Temple and fortress of Saqsaywaman, Cuzco, Peru. Inka’s Empire Tours returns guests to the “gracious, golden age of travel” with accommodations aptly described as “regal” and featuring Belmond hotels: Lima’s Miraflores Park, overlooking the Pacific Ocean; Cuzco’s Monasterio, a four-hundred-year-old monastery, or the Palacio Nazarenas, a former palace and convent; the Sacred Valley’s Rio Sagrado, on the banks of the Incas’ holy river; and Machu Picchu’s Sanctuary Lodge, the only hotel next to the ruins. Where Belmond hotels do not exist, we have chosen other unique properties, such as Lake Titicaca’s Titilaka, on a private peninsula, and the palatial Casa Gangotena, on Quito’s historic Plaza San Francisco. As well as the most memorable lodgings, an integral part of the cultural experience is regional cookery and its nouvelle interpretations. During your tour, savor gourmet cuisine by the great chefs of South America. 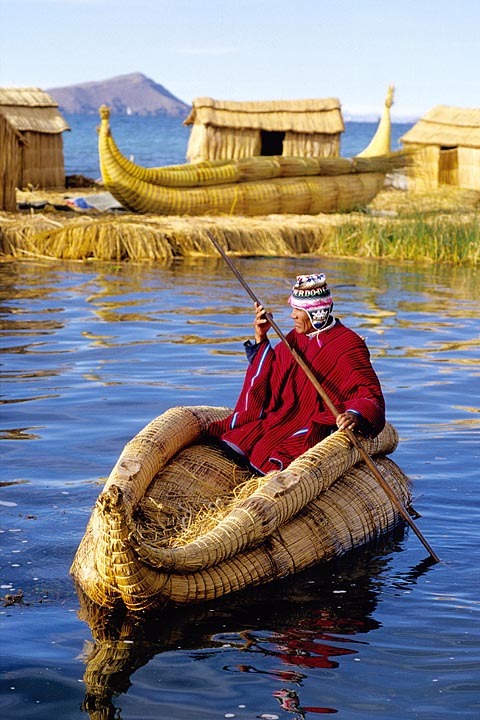 Boatman, Uros Islands, Lake Titicaca, Peru. Photo: Mylene d'Auriol Stoessel. Machu Picchu, Peru Luxury Tours. Our hospitality begins with all of the luxuries you would expect, but it is our personal attention that will make you feel like a treasured guest. Need more convincing? See our Opulent Itineraries and Quotes from Our Guests. To take the first step on your own exploration, browse our Tour Portfolio — or simply contact us. © 2016 Inka’s Empire Corporation, All rights reserved.